Living on the edge of a village in the English countryside, as we do, we are exposed to a lot of smells. Some are very interesting -- like the smell of a freshly-harvested field; others aren't so great -- like the stench of that poop-based fertilizer that the farmers use on those same fields. In last night's weather forecast, I heard that the winds today were going to be coming from the north. I really didn't need to have been told that, though. I would have figured it out this morning without even stepping outside! 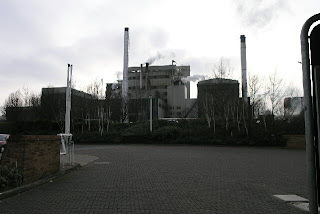 About 8 miles north of us, in the town of Banbury, there's a big Kraft plant that processes Kenco instant coffee. Usually you can only smell the product from the plant where you're in Banbury itself, but this morning I was getting bombarded with the smell through my bathroom window as I took my shower. As you might be guessing, my bathroom is on the north side of our house. The aroma isn't as nice as you might think. To me, it smells of burning coffee. That odor reminds of my father, when I was growing up, as he kept reheating the same batch of brewed coffee off and on all day. Waste not, want not, he'd say. Life's too short to drink horrible burned coffee, I'd say. Maybe that's part of the reason why I'm so picky about my coffee as a grownup!